As if the New York Mets rotation wasn't intimidating enough already. With Matt Harvey, Jacob deGrom and Noah Syndergaard already holding things down, alongside the entertaining Bartolo Colon, the team had no shortage of dependable arms. Then along comes Steven Matz to make things even stronger for the Mets. And unlike most prospects who have appeared in several sets by the time they make the majors, collectors had relatively few Steven Matz cards to choose from. Drafted by the Mets in the second round of the 2009 draft, his first cards quickly followed. 2009 Bowman Draft Picks & Prospects Baseball includes a Chrome Prospect Autograph, which will likely remain his top card. Although not as valuable, Matz has another autograph in 2009 Donruss Elite Extra Edition. This one isn't licensed so the pitcher is in a generic uniform, a turnoff to some collectors. In the ensuing years, Matz was in very few sets. His next licensed cards didn't arrive until 2014 Topps Pro Debut. He has a base card and a manufactured Hat Logo patch card in the minor league product. Matz also has a Bowman Scout's Breakout insert in 2014 Bowman Draft. 2015 Bowman Baseball has the most Steven Matz cards from before his MLB debut. He has a Prospect insert in both paper and Chrome as well as the many parallels for each. Matz is also in the Farm's Finest Mini and Bowman Scout's Top 100 insert sets. Because all of these are inserts, including the basic Bowman and Bowman Chrome cards, and not part of the base set, they're not considered rookie cards. Due to the turn around time required in making checklist, the first Steven Matz rookie cards should be arriving in the fall towards the end of the regular season. The combination of a fast start, early-career dramatics and not a lot of cards to choose from have made Steven Matz cards volatile. Prices are much stronger than they were just a short time ago. For those who bought cheap, the risk of him continuing to play strong might not be worth it. That would make now a good time to cash out. It's going to take a lot to keep that momentum going. The flipside is that Matz is on the Mets and it won't take as much to maintain momentum. He's going to get plenty of attention every time he takes the mound right now. That could result in a prolonged hot streak for the foreseeable future. 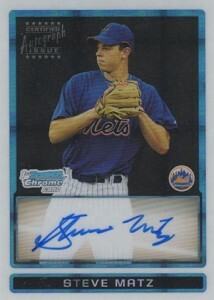 By traditional regards, the 2009 Bowman Chrome Draft Steven Matz autograph is an insert and not a rookie card. However, in the last decade, a player's first Bowman Chrome autograph is usually their go-to card, even after their base set rookies arrive. Look for Matz to be no different. The base version is somewhat widely available. However, because it's from a few years ago, there's not many left to be found in packs and boxes. So most of the supply has dried up. Besides the basic version, there are a handful of Refractor parallels, all of which are serial numbered. Although a lot of players now have both signed and unsigned cards in their first Bowman sets, that's not the case for Matz. The autograph is the only option. This is a more reasonably priced alternative to the Bowman Chrome Draft Autograph that has some pros and cons. The big plus is the cheaper price. It's also serial numbered, which the base Bowman Chrome version isn't. However, being numbered to 790 isn't usually considered all that rare anymore for modern sets. The other knock is that the signature comes on a sticker. Combine that with its unlicensed status and you've got something that's less desirable to the masses but easier to fit some budgets. The card has several parallels that mix color and die-cuts into the equation. Some of these are not signed.